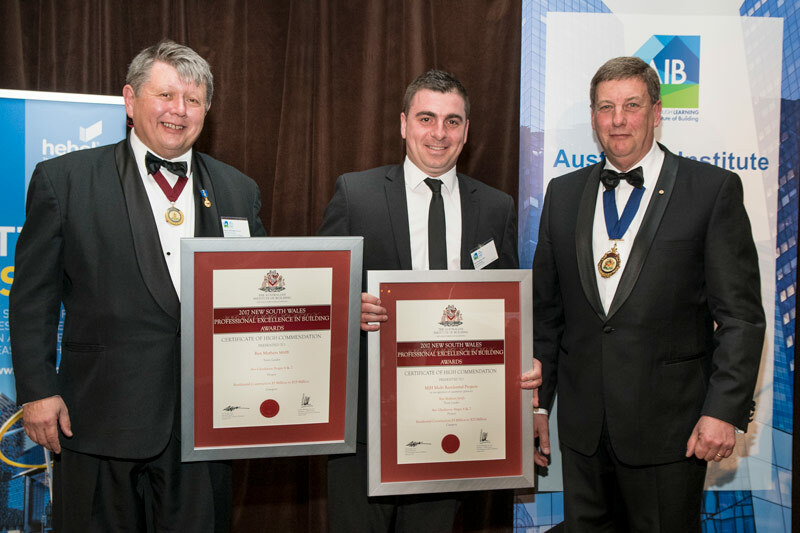 Ben Mathers, General Manager of our NSW MJH Multi team, recently won an award at the Australian Institute of Building 2017 AIB NSW/ACT/HK Chapter Professional Excellence in Building Awards, where outstanding leaders in the field of building were recognised. Ben received a Certificate of High Commendation for Residential Projects valued between $5 million to $25 million for his contribution to the construction of 33 independent living villas at Glenhaven Green Retirement Village for ARV at a recent gala dinner. Ben’s role as Construction Manager of this project was recognised for this award due to the complexities of the site, which included managing difficult construction sequencing issues due to the site containing a large difference in site levels and environmental concerns. Of the 33 independent single storey living units built in the project, there was a mix of single dwellings and duplexes, with 11 of the duplexes located on top of a 4 meter retaining wall. The road for these duplexes was also unable to be accessed so all materials had to be craned into place. This required a large amount of planning and processing due to no location able to accommodate a permanent crane. This required the management of cranage and deliveries which is uncommon for a residential single storey construction. Ben was also responsible for monitoring the contracts administrators to ensure that we met our contractual obligations as well as managing a large number of consultants involved with the Access Consultant requiring a major involvement in the project to ensure the SEPP requirements were met on site. The SEPP required the project to meet the NSW State Environmental Planning Policy (Housing for Seniors or People with a Disability) 2004, (SEPP-HSPD) standards, which also required strong coordination skills. Adding to the complexity of the site was a suspended bridge separating the site and a large bioswale and protected Blue Gum forest which required arborists to approve some tree removals. The suspended walkway had structural steel post supports fixed to concrete footings which needed to be monitored throughout construction by the environmental department. Ben’s overall role was to manage the procurement, design and construction of the project and he noted that, “throughout the project my main objectives were to ensure the safe and quality delivery of the project on time”. Around the 33 units MJH Multi constructed village walkways and seating areas with pergolas. A large number of the pathways linked to meet the BBQ area constructed with amenities for the retirement village residents. Again, these elements had to be constructed within a live retirement village being operated by ARV which required exceptional management skills. Learn more about the Glenhaven Green Retirement Village project.